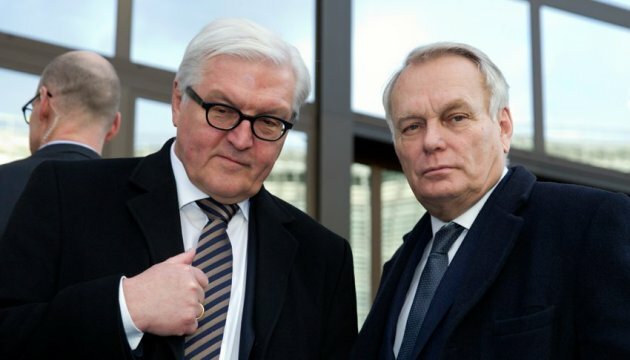 The French Foreign Ministry issued a statement about a purpose of the joint working visit of French Foreign Minister Jean-Marc Ayrault with his German colleague to Ukraine. This was stated by French Foreign Ministry Spokesman Romain Nadal, an Ukrinform correspondent reports. "The purpose of the visit is to achieve full implementation of the Minsk agreements in all the fields and to encourage the Ukrainian authorities to fulfill their commitments in the political aspect," the French diplomat said. Nadal noted that would be the second joint visit of Jean-Marc Ayrault and his German counterpart Frank-Walter Steinmeier to Ukraine, which would take place on September 14-15. In addition, the foreign ministers of the UK and Denmark, Boris Johnson and Kristian Jensen, are also expected to visit Kyiv this week.